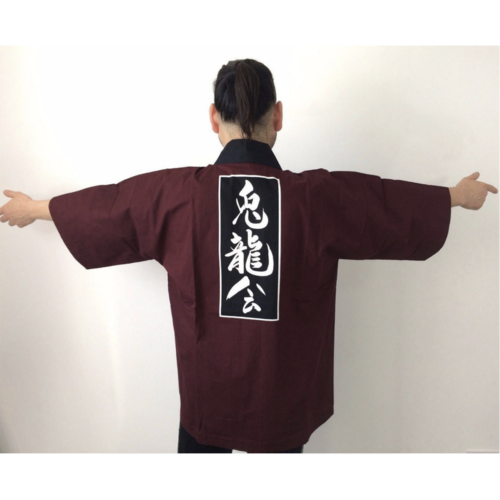 Authentic Japanese dark wine red happi jacket for men and women. This is a uniform for a Japanese club and the kanji means: "Rabbit and dragon club". We have 7 of these jackets all the same size, if you are interested in purchasing more than one, please contact us to make sure of the availability. Brand new without packaging or tags as these are custom made. They are all in a very good condition but because they have been stored away unused for a long time and have travelled in containers from Japan, then we suggest washing them before wearing them as occasionally there is a little mark or dust (no major stains and nothing that can't go away with a simple wash). Please check photos for item description and condition. Thanks. A (Width from cuff to cuff): 133cm/52.3" approx. B (Sleeve width): 27cm/10.6" approx. C (Total length): 80cm/31.4" approx. D (Underarm to hemline): 50cm/19.6" approx. E (Side seam to side seam across back): 67cm/26" approx.